Do you ever wonder what to do with bad photos? which I tend to have a LOT of! I can NEVER NEVER NEVER get a good photograph of these little Sanderlings. feeding in the surf on exposed crustaceans. as we sit along the shoreline waiting for sunset. come out blurry blurry blurry! I played around with a number of different editing programs til I found something that I liked. I used a program called Flare for Mac. It allows me to add effects and textures effortlessly. And I ended up with some useful photos that I could share. illustrate and share a moment. And I guess that's why many of us blog. Stay safe. Beathe deep. Pause. Enjoy. Life rushes by (too fast) just like the sanderlings. 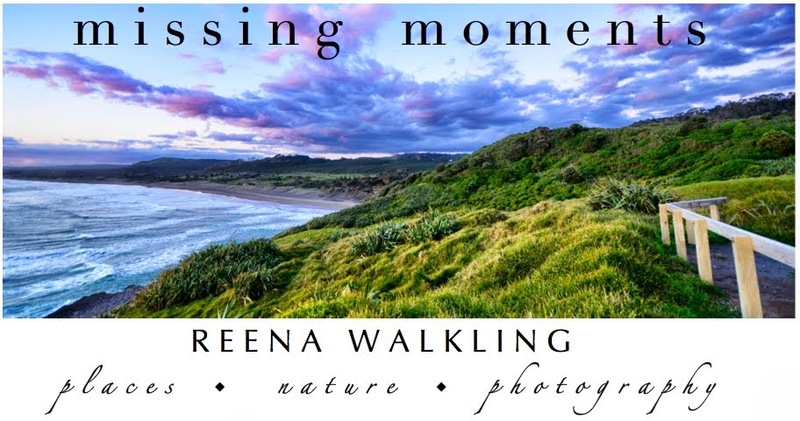 Reena, your Sanderling photos are awesome. This Flare program sounds like something I could use, I am like the queen of blurry photos. Enjoy your relaxing time on the beach and have a great week! I think they're smashing. I have deleted many many blurred photos that were a huge disappointment. you've not only saved these, but made them masterpieces. happy day to you Reena. I like what you've done. Birds are so difficult if they are not sitting absolutely still. I'm so amazed at some of the bird captures I see on Google+ in the photography circles. I think it may take a lot more patience than I have. These ended up turning out terrific! I really like what you did with them. Very fun! You can just see them rushing along! I think these are beautiful! Great program you found. I would frame any one of these. Just wonderful! I love sharing the moments of your day with you. I LOVE them and I think your photos are beautiful! I'm going to have to check out that Flare program! Hope you have a wonderful week, Reena! Relax and enjoy and have a very Merry Christmas! These are wonderful! Thank you for sharing them and writing about your process -- I have many, many blurry or otherwise imperfect images, and I like the idea of processing them to bring out their real character. I love your last words of wisdom. I can just imagine these little birds skittering so fast you can't photograph them, and that is all I really needed to put the scene together in my mind. Thanks for sharing. Just title them "Jogging on the Beach" and they will be perfect as is! :) Love them. I think these photos turned out fabulous!!! A fun solution to a technical issue. Gosh, gorgeously done haunting pictures, and beautiful wisdom as well! The Sanderlings are so cute, and I can even see a water drop water dripping off the beak of one of them. I can see them in my head now, rushing back and forth past you, their little feet going a mile a minute, and you trying to snap them! I guess they run at the speed of time, but you made that into a visably good thing! See you Thursday! And they turned out so well, you could have kept your secret and we would have thought they were supposed to be blurry! Good job. They turned out great beautiful! Lovely post Reena. Don't want our lives to be a blur. You have ended up with an artistic finish. Hi Renna....these are just great I love the look ...especially like the first one!! I LOVE these, Reena! Personally, I'm on a "slightly-blurry-edit" kick! ;-) And like you, I want something simple, so I have Picnik and RadLab. Again...I think your sanderlings are precious. My favorite is the first image. Nice that you found a new lifesaver for crappy photos even if it is with a Mac. The pictures look like you meant to do that. My wife keeps after me to jump ship to a Mac but I continue to resist. These days I wish peace and happiness come to your house. i LOVE your soft, dreamy photos...look like you meant to do that. i'm going to have to check out that flare program. Hi there - a good photograph is one you like. End of story. Your sanderling pictures are splendid - I used a blurred image of some godwits as the header on my blog - although it seems to have shrunk in the last week! Well, I never done that before, I think its a good idea. Brilliant. I think sanderlings are sneaking into 7-11's and making off with the red bull. These are really nice effects. As far as panning, I'd recommend a monopod. Easy to carry, lightweight, inexpensive, and so helpful! Reena!! You have no idea what a blurry photo is. You need to look on my camera. You are my favorite photographer because you make your photos seem like I am there, plus you always have such great words and poems to go with them. and you are right, that is why i blog, to share pieces of life. They're pretty darn good for being bad! I do think your "blur" pictures are awesome. They look more like some Chinese watercolor paintings. Ack! Just lost a comment because I am on a strange computer in a poor position -- partially recumbent in a Lazy Boy. These have been salvaged quite well. They have an excellent mood and feeling. These are awesome photos, the first one is very surreal. Great job! I thought they were sandpipers. 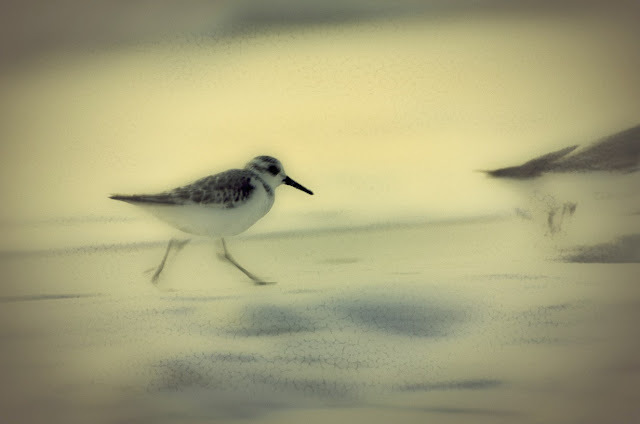 Sanderling - wasn't that the name of some mediocre comedian that somehow got his own show? Thanks for the pic app tip. I LOVE what you've done with these shots!! 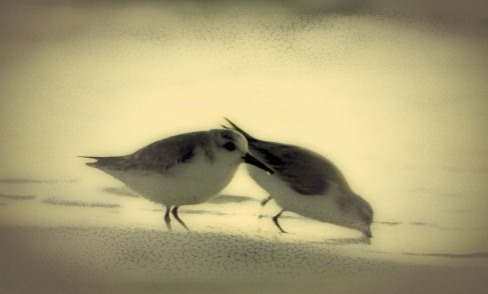 I have deleted so many photos of those little sanderlings.. They are too cute. I LOVE your editing.. I might have to re-thing the next time I want to delete..
Gorgeous effects. These should be hanging in a gallery! Sanderlings are great examples of how life rushes by! Love the first photo. Really. 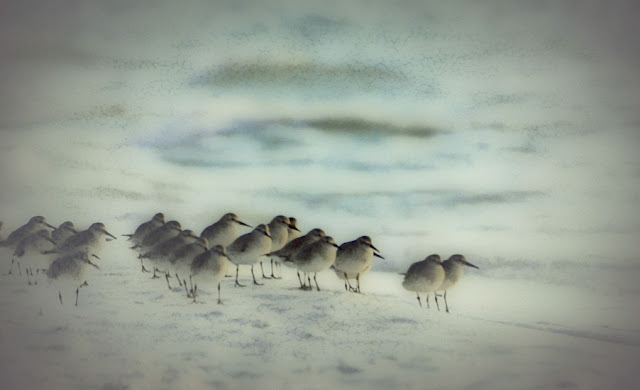 Your sanderlings are just the sweetest treasures Reena - they would look so pretty in a shabby-chic white frame. Wonderful ... just wonderful the message they convey. 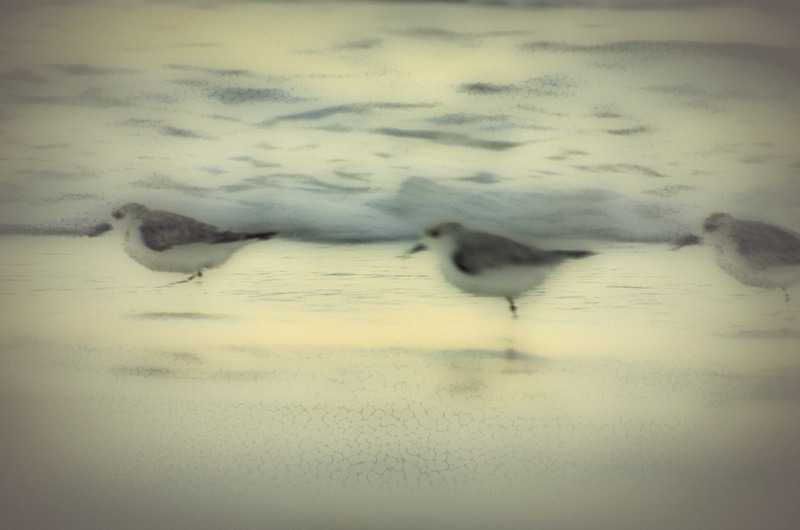 Love your blurry birdy photos! These are beautiful!! I love the blurred motion, it really tells the story. Beautiful pictures, they do tell a story. Wow wow wow! Those shots are just dreamy! I'd love to try out this program. These shots look great. They show a dreamy movement which works so well. I just love them! Ah Reena, you may not have a very sharp shot of A sanderling but the first group family affair is worth a dozen brilliant singles! Very cool. I love how they turned out. Wonderful post. Seems to me you captured them perfectly in your inperfection. I think the pics are fabulous. Enjoy! Cheers!! Loved this post and my visit here. 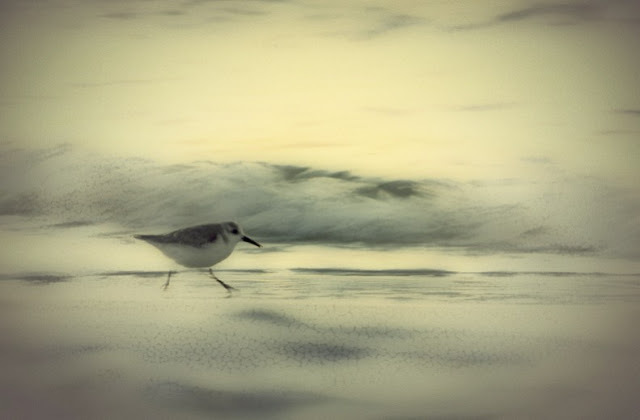 I think your sanderling shots here are wonderful - they show the spirit of creativity and essence of these busy birds on the beach.